I was really excited about turning 40 because I kept hearing commercials on XM Radio about this terrific product specially made to help women 40 and over lose weight through balancing their hormones. Sadly, a little over a week before my 40th birthday, my bubble was burst when I saw that the FTC had filed a lawsuit against the company who markets the product, Amberen, for misleading claims. But it’s a good thing that I was paying attention to the product because it turns out that the suit actually may have an impact on performance based marketing because a blogger was involved. Amberen is a dietary supplement. The FTC alleges that Lunada Biomedical (who markets and sells Amberen) engaged in “unfair or deceptive acts or practices” in the way that it marketed the product in the U.S. Specifically, they claimed that Lunada made unsubstantiated claims about weight loss and other health benefits of Amberen and misrepresented the findings of medical studies. In addition the “risk free trial” claims were false. One of the places that Amberen was marketed was through various websites including “Carol’s Blog” (www.carolsblog.com). Carol was actually the president of “International Marketing Company” (presumably an agency) and not only agreed to write a blog that would promote them but would also appear in some of their other advertising. Carol was paid a flat rate of $2,000 per month plus various other fees and reimbursement costs. 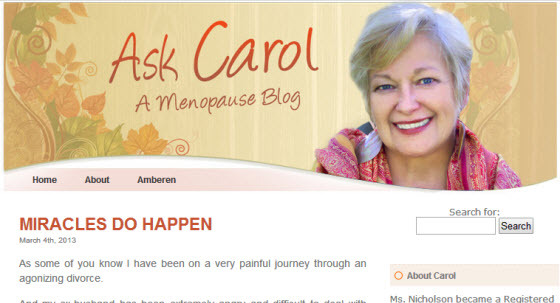 According to the suit, the blog “appeared to be a personal account of [Carol’s] experiences with menopause, written in the first person and featuring [Carol’s] name and photo.” There was no disclosure on the site that Carol was being paid to promote Amberen on the blog. Although Affiliate Marketing is not directly implicated in this case because Carol was paid a flat rate rather than on a performance basis, there are definitely some interesting things we can pull out of this case. Note: These are all my opinions! Although I am a lawyer, none of them should be used as legal advice. They are merely my observations based on my studies of the law and my knowledge of blogging and affiliate marketing. Merchant is once again held liable. In this case, even though the blogger is mentioned throughout the case and plays a part in the majority of the “deceptive practices,” the company producing and marketing the company is the one being sued by the FTC. I have not seen anything to indicate that Carol is being sued. The blogger’s name is now associated with deceptive practices. Even though the blogger was not named in the suit, her name and her company are now showing up in search results related to FTC lawsuits. As bloggers, all we have are our reputations. Once you are associated with something like this, it’s almost impossible to make it disappear online. Disclosure standards reiterated. The court specifically referred to “failed to disclose” and “material relationship.” These are the words that we are consistently seeing in the Guidelines from the FTC and any similar suits. They should be the basis of your own disclosure standards whether you are a merchant, an OPM, or a blogger. Material to consumers. In this case, the FTC believes that Carol’s personal style of blogging (and perhaps her status as a nurse?) were enough to convince people to buy the Amberen. This is important when it comes to determining when something would be considered an endorsement that would convince someone to make a purchase based on your recommendation. Agencies are likely liable. Lunada acted as both the distributor AND the marketing company in this case. In our lingo, that means they were both the merchant and the affiliate manager. They started the relationship with Carol. They gave her content ideas and reviewed the posts on her site. It’s the obligation of the merchant (or their agent) to monitor the content AND the disclosure for compliance. Resources: For more information about the case, you can read the FTC release that summarizes it or the full complaint including exhibits. Although the blog is no longer online, you can see it using the Wayback Machine. Read more of my analysis of the .com Disclosures and how they apply to affiliates. Have you as a blogger, merchant, or OPM taken steps to make sure that you are complying with the FTC Guidelines? Or are you weighing the risks and deciding that it is not likely you would be sued anyway? Great post, Tricia. Thank you! While I was disclosing years before the FTC said I had to (simply because I felt it was a good thing to let customers know), at some (early) point it seems to me that the 1st Amendment kicks in and protects our speech. I am for full voluntary disclosure but fear it is a slippery slope to be told under the force of law what we must say. The Better Business Bureau, Angie’s List, and many others within the market are sorting these things out. Customers must be wise enough to not buy hype and should be sensitive to the absence of voluntary disclosures I feel. Also, the industry would be wise to police itself and pass on questionable marketing connections. Very valid point Mike. Corporations claim 1st amendment right NOT to disclose many things that should be. For instance, not labeling food as GMO used this very claim. Further, the FTC sure doesn’t apply the same concepts or rules to television advertising. How many times we all see paragraphs of text so small you can’t read it and it disappears (or commercial ends) before you can stick your face in the screen and hope you’re the world’s fastest speed reader. I personally believe nothing I hear, read, or see in advertising. Advertising & marketing’s primary goal is to sell, sell, sell. Truth is secondary. If anything catches my eye or ear I always research through appropriate channels and with trustworthy reputations.